Looking to lose weight this new year? If you haven’t heard of the 21 day fix diet, you’re in for a treat! One of the best ways to slim down is combining daily exercise with a solid diet plan, and that’s exactly what you get with the 21 day fix. 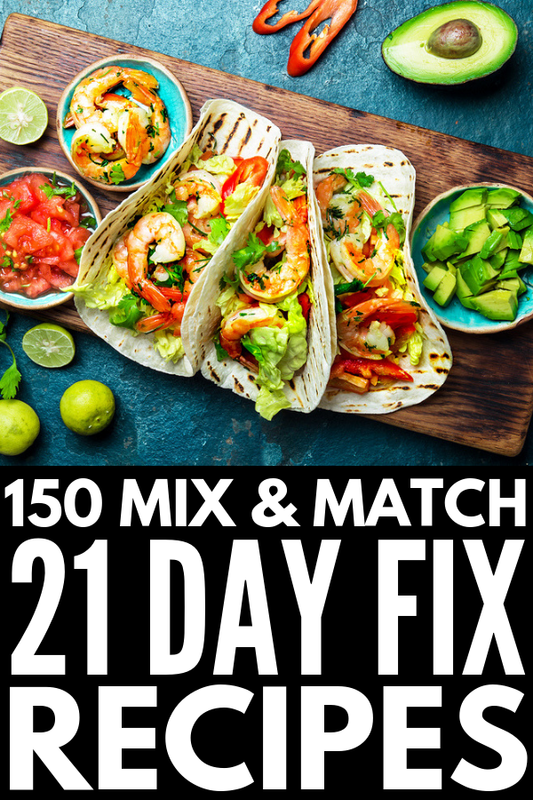 From 21 day fix lunches and snacks, to 21 day fix dinners and desserts, you’re going to love these 21 day fix recipes as much as we do! What is the 21 Day Fix Diet? The 21 day fix diet got its name from the idea that it takes 21 days to create a habit. The diet focuses on short-term dramatic weight loss, rather than long-term lifestyle changes, promoting weight loss in just three weeks. With the 21 day fix diet, you use colour-coded containers to measure your portions. You get one 8 ounce green container for veggies, an 8 ounce purple container for fruits, a 6 ounce red container for proteins, a 5.3 ounce yellow container for carbs, two 2.7 ounce orange containers for seeds and dressings, and a Shakeology cup for shakes. How Does the 21 Day Fix Diet Help with Weight Loss? Through physical activity and portion-control containers, the 21 day fix diet boosts weight loss and improves the quality of the food you eat. It allows you come up with a healthy eating and weight loss plan by helping you figure out how many calories you should consume daily by giving you a daily container allowance. To find your calorie intake, multiply your current weight by 11 and add 400 (this covers the calories you burn during your daily workout). This number is the daily calorie intake you need to consume to maintain your weight. Subtract 750 if you want to know the number of calories you need to eat to lose weight! Diets are much easier when you create a meal plan for yourself. Make a meal plan each week (with the help of the 21 day fix containers) and do a big grocery shop at the start of each week to ensure you have the proper food for the week ahead. Just like any diet, there are foods you should and shouldn’t eat on the 21 day fix diet meal plan. Follow a 21 day fix food list like this one to stay on track! Another great way to be successful on a diet is to prep your food for the week ahead. Hard boil eggs, pre-cut veggies, stock up on berries and fruits that don’t need to be cut, and cook make-ahead meals on Sundays! Losing weight can be easy if you follow the 21 day diet! Use these tips and recipes to slim down this year! If you loved these 21 day fix recipes, please share this post on Pinterest! And if you want more diet tips and trick, make sure to follow our Health Board on Pinterest!